How fruit juice is produce is as important. If a fruit maker produces heat, it kill the natural vitamin C too. It is Important that the fibre in the fruit is drank with the juice to reduce the high calories after a fruit is made into juice. 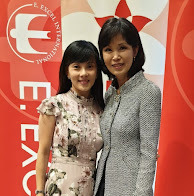 I am glad that I found E Excel which formulate its products based on the science of nutritional immunology and using cutting edge technology to retain the wholesome plant food nutrients and using state of the art equipments to give us the best quality, safety, unique, convenient and effective products from womb to tomb.